Trading Volatility: 2014: Is It Still Profitable To Be Short VXX? The markets are off to a bit of a rocky start to the year, particularly in the last couple of weeks. This is a distinct change of pace after a rather quiet end to 2013. VXX is +6.84% YTD after hitting a high of +30% on Wednesday. Will VXX see another year like 2012 and 2013 with losses of 60%? Or are we likely to see performance closer to 2011? 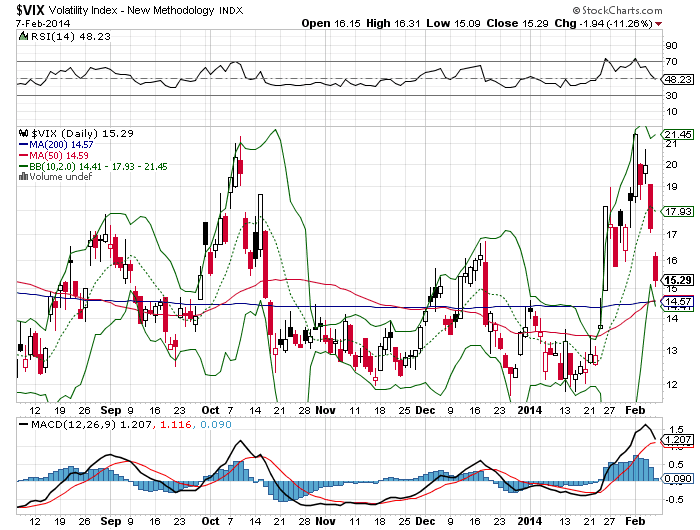 VIX broke out above its 200SMA (14.4) on Jan 24 to start a rally that peaked at 21.48 seven days later. Since then it has quickly retreated and is approaching the 200SMA (now at 14.57) from the other direction. There are some other notable moving averages in the 14.4-14.9 area including the 100SMA, 50SMA, 60EMA, 90EMA and the lower envelope of the 10-2 Bollinger Band, as well as support levels established by previous VIX spikes. This suggests another 5% downside in VIX before support. Taking a look at VIX futures (chart below), we went into backwardation for a day on Jan 24 and returned for six more days from Jan 30 through Feb 6. This was the longest string of backwardation we've seen since the the Aug 2011 selloff. The impact that backwardation and rising VIX futures have on the price movement of VIX ETF was made clear as XIV fell 30% from its Jan 22 close to its Feb 5 low. Although XIV has recovered somewhat and is down "only" 17% from Jan 22, it is still at risk for further declines should we see a move back to backwardation (also see "XIV: When a 'Sure Thing' Goes Bad"). This was a relatively mild volatility spike with VIX reaching just beyond its long term average of 19.8. Should this move in VIX continue to be more than just a blip on the radar, XIV could see some major losses. We're now back in a slight contango after Friday with Feb at 15.47 and March at 15.88. Feb VIX futures are 1% above spot VIX, which is a very small premium with six trading days left before Feb VIX futures expire. Typically you can expect VIX and expiring VIX futures to remain pretty well coupled as we approach expiration. Looking at our Bias forecast over the past six months, the negative bias on VXX has been trending smaller resulting in a more difficult short of VXX. Our VXX Spike Risk forecasts showed a substantially elevated risk over the last few of weeks rising from 25% up to 70%. First and foremost, let's respect the fact that the market is moving higher, the VXX bias is back to negative, and the VXX WRY is below its 10SMA. Follow this trend and see how we do with the various levels of resistance in the S&P 500 next week (1810 and 1820). Let's also respect the fact that XIV dropped 30% on a modest 5% pullback of the S&P. We are in a relatively old bull market which is rather complacent and investors are heavily leveraged while shorting volatility is a crowded market. We don't yet know if the emerging market issues from the past 2 weeks were just noise or the start of a real problem. When we hit a real problem somewhere down the line VIX will spike quickly and severely and I, for one, don't want to be heavy on the wrong side of the trade when it does. Please login to the Members' Forum to finish reading this article. If you're not yet a member you can join via the Subscribe page.